I wanted to read this book because I enjoy historical fiction, including stories set in the post-Edwardian era. 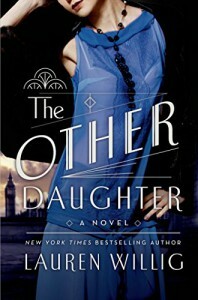 The Other Daughter hints at romantic entanglements, but I read it more as hybrid of drama and suspense. Imagine if a later season of Downton Abbey introduced a character who turned out to be Lady Mary's half-sister, born to Grantham's "first love." I read about 80% of the book in one night to see what would happen. In sum, Rachel Woodley arrives from a governess appointment in Paris to find her mother has not only passed, but kept her father's true identity from her. Her desire for closure leads her to agree to a charade planned by a distant relative (with the aristocracy, seems they're all related in some way) to pass herself off as a woman of means and integrate into society. Get into the good graces of her half-sister and use her to get to her father and then...well, Rachel needs to figure out that part. I enjoyed the entire story - the discovery, the transformation from Rachel into society girl "Vera", and how her feelings for various players in the game change over the short time. The book ends happily enough, perhaps not in the way you would expect, but it seemed to me it stayed true to certain attitudes among nobility.